Fishing For Customers: Zen and the Art of Persuasion. Part 3 of 3. Fishing For Customers - Free Small Business Marketing and Advertising Tools, Tips, Articles, Strategies, and Advice. Fishing For Customers: Zen and the Art of Persuasion. Part 3 of 3. The formula is basic: State problem. Agitate problem. Announce solution. Create a free brochure, a white paper, or report that will be of interest to people who are seriously considering the purchase of what you sell. Your information becomes a no obligation, low risk, non-threatening reason to start a relationship with you. Send an e-mail or a conventional letter. Run a radio ad, offer it on your website, or print an insert for the local newspaper. Get the word out that you’re offering valuable information for anyone considering buying what you sell. At this point, your hot prospects will identify themselves by asking for a copy. You did capture their contact information, didn’t you? Names, addresses, phone numbers, and e-mail addresses? Because now is time for the follow ups, in which you cultivate a relationship and turn them into customers. Sign them up for your newsletter. Invite them to an open house. Offer a free consultation, or an invitation to a free seminar. Offer a special promotion. Offer more information. Build the relationship. Chuck McKay is a marketing consultant who helps customers discover, and choose your business. 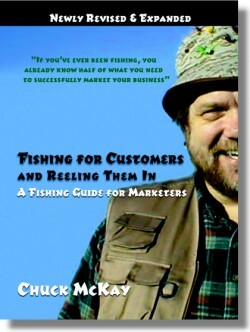 Questions about single-step and two-step advertising may be directed to ChuckMcKay@ChuckMcKayOnLine.com.